MultiMounts provide stereo component, record turntable and loudspeaker isolation and damping like no other competing device. They are precisely user-adjusted to the weight distribution of the supported equipment in 1lb. or 3lb. increments for the specific weight they will support. 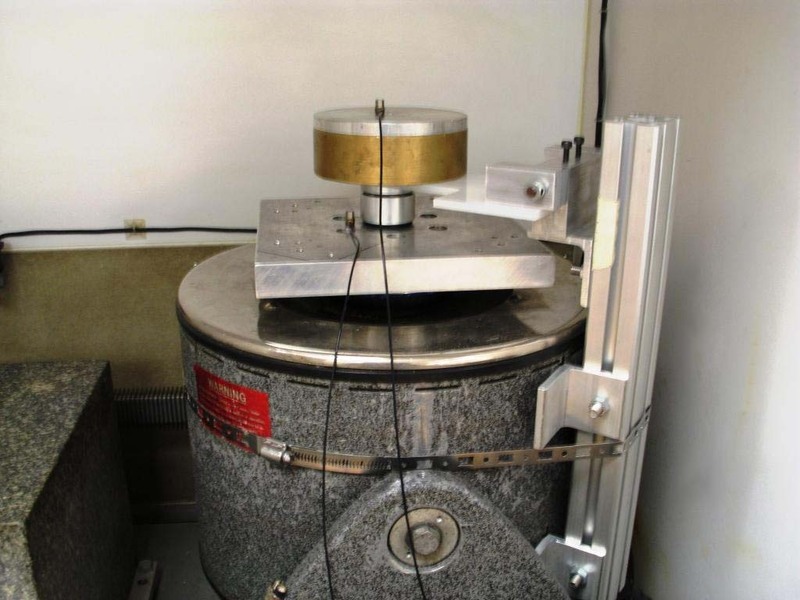 MultiMounts enable stereo equipment to perform at its full potential by drastically reducing the level of damaging vibratory energy that can enter or reside within it. The MultiMount was developed using sophisticated laboratory testing with computerized accelerometer and shaker-table evaluation. MultiMounts provide six-degrees of freedom isolation and they produce a natural frequency as low as 6hz! MP-1 Viscoelastic Pellets support 1lb. each, priced $20.00 for a "Ten-Pack"
MP-3 Viscoelastic Pellets support 3lb. each, priced $20.00 for a "Ten-Pack"
30-Day, Money-Back Guaranty: MultiMounts will outperform competing devices and "isolation platforms" costing thousands of dollars or we will refund the full purchase price. Please refer to the Owners Manual for instructions! MultiMounts provide direct chassis or cabinet support for any component, loudspeaker and many turntables. They can be placed upon any platform, furniture or on the floor, where they can be used as an amplifier or speaker "stand". The Spike Adapter provides loudspeakers and turntables with spikes an alternative to direct chassis support by accepting leveling spikes. The Adapter interfaces with the Visoelastic Coupler at the top of the Mount. A conical counter-bore in the top of the Adapter will accept virtually any spike. MultiMounts are not “tweaks” or “tuning” devices that impose a "sonic signature". They are not “additive” devices that shift tonal balance or exaggerate certain frequencies. Instead, they are “subtractive” because they minimize degrading vibratory energy and thereby enhance performance throughout the entire audible frequency range. 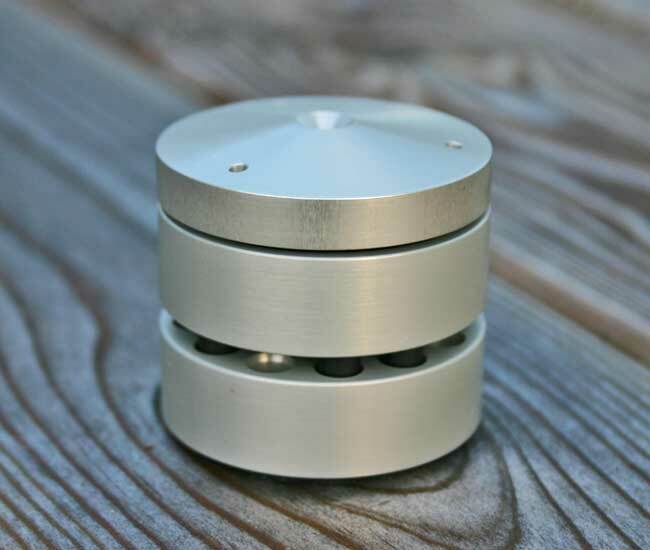 The MultiMount is comprised of two identical, vertically opposed aluminum discs machined to very close tolerances and beautifully finished. Assembled, it measures 1.40" high x 1.810" in diameter and the New Viscoelastic Pellets are .220" in diameter x .550" long. The MultiMount has an array of flared counter-bores into which the user places from (1) to (16) Viscoelastic Pellets, depending upon the weight to be supported by the Mount. The Pellets come in 1lb. and 3lb. 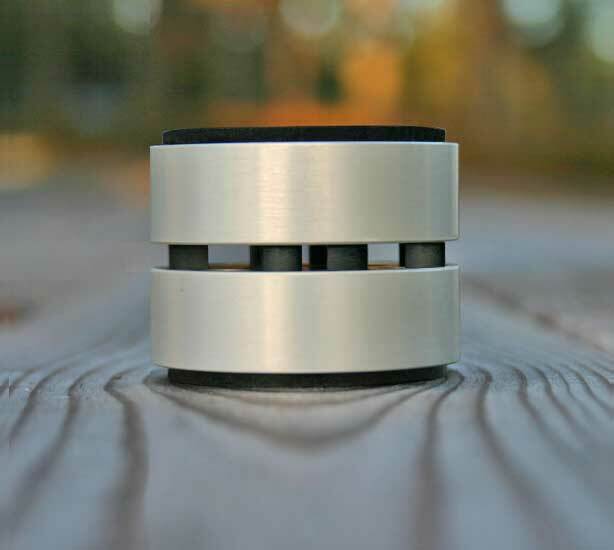 versions and each Mount can accept up to (16) Pellets, so therefore each Mount has a weight capacity of up to 48lbs. The much larger Pellets are made of an improved, highly damped, proprietary elastomer. The 1lb. Pellets can effectively isolate components as light as 3lbs! The weight distribution of the equipment to be supported can be determined by the use of a (household) scale to calculate the “load” or weight to be supported by each individual Mount. The Owner’s Manual gives clear, illustrated instructions for weighing and calculating the required number of Viscoelastic Pellets. Assemby of the New MultiMount is quick and easy! Insert the desired number of Pellets into the counterbores of the bottom half, visually align the Pellets with the corresponding counterbores of the top half and push together. The large Pellets and deep counterbores insure that the MultiMount will remain intact during handling and setup. MultiMounts provide extremely stable, non-sliding stereo component, record turntable and loudspeaker support. MultiMounts in groups of three (3) are fine for support of most stereo components - especially those which are not very heavy and those that are heavy but have thicker “plate” chassis. Two (2) Mounts are placed beneath the heavy end of the component and the third (single) Mount is generally centered under the opposite end. Very good performance may be so obtained. However, it should be noted that using only one (1) Mount under one side of a very heavy component that has a flimsy, light-gauge chassis, may cause the chassis to bend upwards. Using four (4) Mounts (or more) eliminates this issue of inadequate support, adds structural rigidity to the chassis which reduces vibration and offers the benefit of additional chassis damping provided by the “extra” Coupler(s), albeit at a higher cost. The MultiMount's innovative design is based upon well-established, irrefutable engineering science that is integral to vibration control in all major industries. 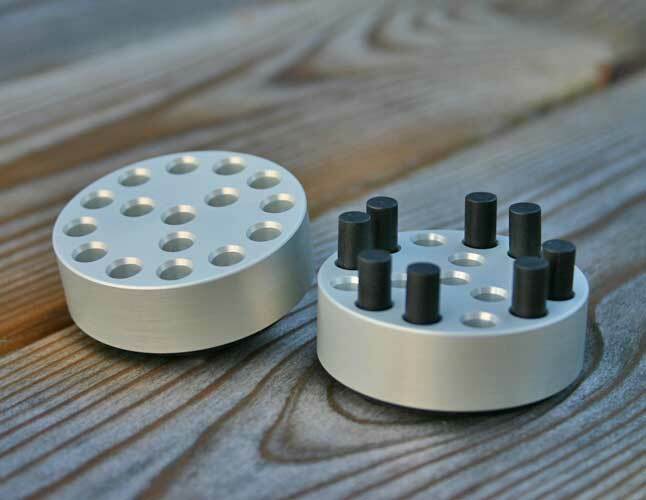 The MultiMount provides omnidirectional isolation because the Viscoelastic Pellets deform, ie; "bulge", bend, tilt and twist in response to the supported load and to vibrational forces, allowing the Top and Bottom Discs to move independently. In simple terms, if the supporting structure moves in any direction or in multiple directions simultaneously, the supported equipment remains relatively still or isolated because the MultiMount provides relative movement or compliance between the supporting structure and the equipment. In addition to isolation, the Pellets also provide damping of vibratory energy when they are deformed or "strained" by a process called hysteresis, whereby vibratory energy is converted into heat energy and dissipated. If a record turntable, stereo component, loudspeaker or rack imposes disturbing vibrational forces upon the Mounts, the Pellets damp or minimize these forces. The proprietary material, size and shape of the Viscoelastic Pellets are all vital to their extraordinary effectiveness. Each Pellet is a tiny "power-plant" of energy conversion! The Pellets will provide peak performance for at least 2-years, after which we recommend their replacement. Very effective component chassis or louspeaker cabinet damping is provided by a heat-resistant Viscoelastic Coupler that is retained in the counter-bore of the Mount's top disc in a constrained-layer design. This elastomeric (soft) interface also eliminates any possibility of “chatter” or “noise” often caused by the contact of two hard materials “excited” by vibration. The Top Disc of the Mounts can deflect from the horizontal plane due to the elastomeric nature of the Viscoelastic Pellets and can thereby “self-align” with the chassis of a stereo component which is uneven or not plane. A second Viscoelastic Coupler retained in the counter-bore of the Mount’s base provides damping of vibratory energy in the structure that supports the Mount and minimizes the flow of energy into the Mount from the supporting structure. This Coupler also eliminates “chatter” and prevents surface scratching and will not stain. MultiMounts, like no other competing devices or "isolation feet or footers", provide user-adjustable, weight-optimized isolation for ultimate stereo equipment performance. They are precisely weight-matched to the component, making them the world's only truly “universal” vibration isolation mounts! Viscoelastics are weight sensitive. They perform poorly if they are under-loaded, or overloaded. A viscoelastic part provides optimum isolation, only within a narrow weight margin. Most competing devices and systems do not address this crucial issue at all. Some offer a choice of a few "standard" isolators or platforms to support an excessively wide range of equipment weights, which is a poor compromise. But even these "better" systems mostly ignore a second critical issue - that of component weight distribution. Many stereo components are significantly heavier either in the front or the rear or on one side and thereby will exert significantly different loads on the supporting isolators. A “weight-balanced” component supported by (3) isolators puts double the load on the single isolator as compared with each of the other two isolators! Any product that ignores this fact is simply inadequate and inferior. “Isolation Platforms”, regardless of cost and complexity, which support stereo components by their stock feet simply ignore the important issue of component chassis damping. Such products may provide isolation ONLY, but this alone is not sufficient to provide ultimate component performance. Stock rubber feet provide poor damping and actually "trap" degrading component-borne vibration because they do not adequately conduct vibratory energy into the platform. Finally, products that provide damping only of high frequencies or "micro-vibrations" cannot possibly isolate stereo equipment from lower frequency disturbances. Low frequency acoustic energy from drums, timpani and synthesizers as well as sudden, low and mid-frequency dynamic music peaks create powerful, disturbing movement of the listening room structure and evertything in it. MultiMounts effectively isolate and damp high and low, "micro" and "macro" frequency vibratory energy like no other competing product. Buyers of vibration control devices for high-end audio should know the basic definitions of, and the distinctions between, ISOLATION and DAMPING to enable them to make informed purchases! A Vibration ISOLATOR is a viscoelastic part or a device that provides relative movement between the supported component or loudspeaker and the supporting structure, ie: a rack, a platform or the floor. A Vibration DAMPER is a viscoelastic material or a device that converts vibratory energy into heat - thereby dissipating the vibratory energy. For Stereo Equipment, the best performance can only be obtained through properly designed vibration isolation and damping. Vibration Isolation refers to the process of preventing (minimizing) externally generated vibratory energy from reaching a structure or component. Although this includes acoustic or air-borne vibration that is difficult to manage in exposed audio/video equipment, we are primarily concerned with the transfer of mechanical vibration. And, it is essential to understand that there is no significant mechanical isolation provided unless there is relative movement between the component or loudspeaker and its supporting structure to minimize sympathetic movement with the supporting structure. Therefore, only a device or material that can compress like a spring or deform like an air-bag or a viscoelastic part, or “roll” like a bearing, can be an isolator. Exceptions to these “passive” examples include “active” systems that have electromechanical mechanisms. Obviously, hard “spikes”, "cones", captive ball "bearings", "platforms" or "shelves" are not effective vibration isolators regardless of their material composition! However, a platform supported by isolators as part of its design can provide isolation. Vibration Damping is the dissipation of vibratory energy in a structure or equipment. It refers to the process of removing (minimizing) self-generated vibratory energy by a stereo component or loudspeaker AND any external vibration that, for lack of adequate isolation may enter the component, by converting the mechanical vibratory energy of solids into heat energy - a process called hysteresis. Vibration damping is best accomplished by direct coupling to the equipment chassis or loudspeaker cabinet using viscoelastic materials in a constrained-layer design.